Harvest House Publishers, 9780736929592, 324pp. 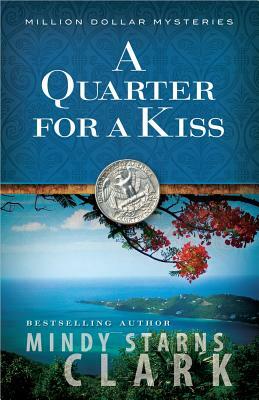 With a touch of romance and a strong heroine, A Quarter for a Kiss offers more of the fast-paced and suspenseful inspirational writing found in A Penny for Your Thoughts, Don't Take Any Wooden Nickels, and A Dime a Dozen. In this fourth book of the Million Dollar Mysteries, Mindy Starns Clark weaves another tale of mystery and God's touch on the lives of those who seek Him. As a young widow, Callie Webber finds strength in her faith in God and joy in her growing romance with her employer, Tom Bennett. When their friend and mentor, Eli Gold, is shot, the search for answers as to who and why leads Tom and Callie to the beautiful Virgin Islands. There they face a sinister enemy among the ruins of an old sugar plantation--an enemy who's willing to do anything to keep his identity secret and the past deeply buried.